Sail plan: 856 sq. m.
Mercury (Russian: Меркурий) was a Imperial Russian Navy 18-gun, two-masted warship. It is famous for its lopsided battle with two Turkish ships, which took place on May 14, 1829. The name Pamiyat Mercuriya (literally In Memory of Mercury) was given to a number of ships of the Russian Baltic Fleet. Pursued by a Turkish fleet (6 ships of the line, 2 frigates, 2 corvettes), the Russian brig Mercury engaged in a lopsided battle with the ships-of-the-line Selimiye (110 guns) and Real-bei (74 guns) near the Strait of Bosphorus. After damaging the ships one by one, the brig escaped pursuit. Aleksandr Ivanovich Kazarsky, Lt. Capt. Ivan Petrovich Prokofyev, naval pilot Lt.
By official information, neither Turkish ships lost crew as the brig's main objective during the battle was to damage their spars and rigging. 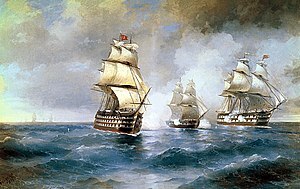 The position of the ships portrayed by Aivazovsky in his work has been criticized as being historically inaccurate because of the brig's position between two significantly larger Turkish ships. Still, it's possible that Aivazovsky's artistic impression simply heightened the tension in the painting by accentuating the hopelessness of the brig's situation. Paintings by other artists (Krasovskiy, Barri, Pechatin) of the same battle, though less known, portray a more realistic depiction of the battle. ^ "Maritime Expeditions". rusnavy.com. Retrieved 2018-07-27. ^ "XI. Say in one word, see the words below". StudFiles (in Russian). Retrieved 2018-07-27. This page was last edited on 12 April 2019, at 08:13 (UTC).